For other uses, see Wardrobe (disambiguation). "Armoire" redirects here. 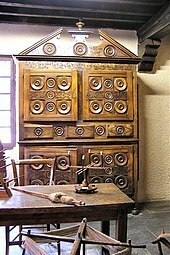 For the type of desk, see armoire desk. Throughout the chronological changes in the form of the enclosure, it more or less retained its preset function as a place to retain a king’s robe. The word has gained coinage over successive generations as an independent store for among others, preserving precious items for a ruler like gold, well highlighted in King Edward I's times. It is also a simple patio where clothes are hung from metal bars or tucked inside utility racks running from up to down. The modern wardrobe differs in one respect from the historical one for its triple partitioning: there are two linear compartments on either side with shelves as well as a middle space made up of hanging pegs and drawers, the latter being a latter-day addition, besides a clothes’ press in the higher central space on level with a person’s chest. Additionally, an armoire is a wardrobe that is wider than a grown adult's wingspan, while a wardrobe is smaller. The word wardrobe appeared in the English language in the early 14th century. It originated from Old French words warderobe, wardereube and garderobe, in which "warder" meant "to keep, to guard" and "robe" meant "garment". A common feature was to base future size on the eight small men method. A considered good size double wardrobe would thus be able to hold within its capacity, eight small men. 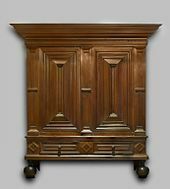 In the nineteenth century the wardrobe began to develop into its modern form, with a hanging cupboard at each side, a press in the upper part of the central portion and drawers below. 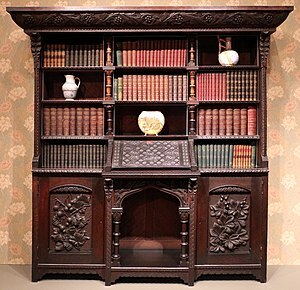 As a rule it was often of mahogany, but as satinwood and other previously scarce, fine-grained, foreign woods began to be obtainable in considerable quantities, many elaborately and even magnificently inlaid wardrobes were made. The penultimate step in the evolution of the wardrobe was taken when the central doors, which had previously enclosed merely the upper part, were carried to the floor, covering the drawers as well as the sliding shelves, and were often fitted with mirrors. In the United Kingdom, a more affluent option is custom-fitted wardrobes, which are built around the size and shape of the room. 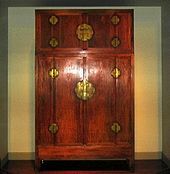 Kas, kast or kasten (pronounced kaz) is a massive cupboard or wardrobe of Dutch origin similar to an armoire that was popular in the Netherlands and America in the 17th & 18th century. It was fitted with shelves and drawers used to store linen, clothing and other valuables and locked by key. They were status symbols and family heirlooms in the Low Countries and imported luxury goods to the American colonies. As such they were often made of quality wood such as cherry, rosewood and ebony and paneled, carved or painted. ^ Harper, Douglas. "wardrobe". Online Etymology Dictionary. ^ Segal, Troy. 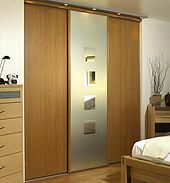 "Kas or Kast Wardrobe Example". www.about.com. About.com. Retrieved 11 July 2014. ^ "Kas". www.brooklynmuseum.org. Brooklyn Museum. Retrieved 11 July 2014. Wikimedia Commons has media related to Wardrobes.